Sarah Bray, an incredibly talented wedding photographer in central Florida, wishes she could live inside an Anthropologie catalog. She came to us with a vision of creating a brand that was sophisticated and slightly whimsical, since most of her clients are creative, non-traditional brides. 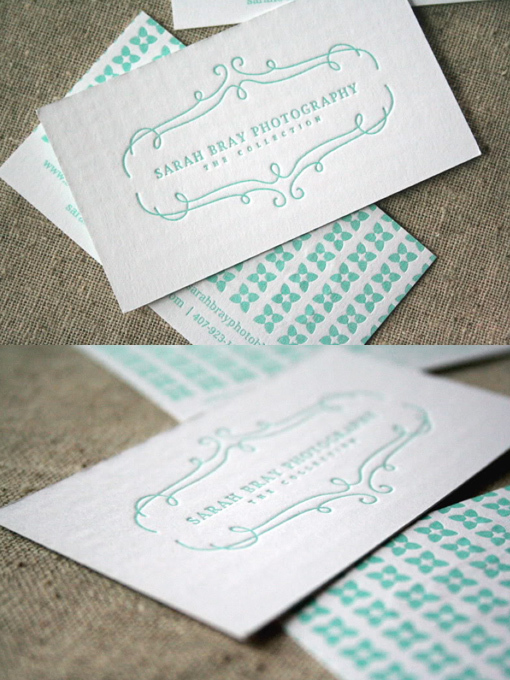 When it came to her business stationery, Sarah had her heart set on letterpress cards. With her great taste and unique sense of style, she was every graphic designer's ideal client! For someone who really wanted to make an impression (literally, ha), we couldn't think of a more fitting method of printing for Sarah. Using a single color on each side, these cards were printed on Neenah Neutech 160# Pure White cardstock.